"Lord Lyon" redirects here. For the thoroughbred racehorse, see Lord Lyon (horse). The Right Honourable the Lord Lyon King of Arms, the head of Lyon Court, is the most junior of the Great Officers of State in Scotland and is the Scottish official with responsibility for regulating heraldry in that country, issuing new grants of arms, and serving as the judge of the Court of the Lord Lyon, the oldest heraldic court in the world that is still in daily operation. The historic title of the post was the High Sennachie, and he was given the title of Lord Lyon from the lion in the coat of arms of Scotland. The post was in the early nineteenth century held by an important nobleman, the Earl of Kinnoull, whose functions were in practice carried out by the Lyon-Depute. The practice of appointing Lyon-Deputes, however, ceased in 1866. 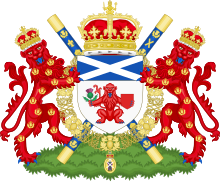 The Lord Lyon is responsible for overseeing state ceremonial in Scotland, for the granting of new arms to persons or organisations, and for confirming proven pedigrees and claims to existing arms as well as recognising clan chiefs after due diligence. He also registers and records new clan tartans, upon request from the clan chief. The Lyon Register (officially the Public Register of All Arms and Bearings in Scotland), on which the Lord Lyon records all Scotland's coats of arms, dates from 1672. As Lyon Court is a government department, fees paid for granting coats of arms are paid to the Treasury. The misuse of arms is a criminal offence in Scotland, and treated as tax evasion. Prosecutions are brought before Lyon Court, Lord Lyon being the sole judge. Appeals from the Lyon Court can be made to the Court of Session in Edinburgh. There is no appeal if the Lord Lyon refuses to grant a coat of arms, as this is not a judicial function, but an exercise of his ministerial function, although an appeal by way of judicial review may succeed if it can be shown that the Lord Lyon acted unreasonably. Being responsible for Scottish state ceremonies he parallels the Earl Marshal in England. The Lord Lyon is the heraldic authority for Scotland, much as the English Kings of Arms are responsible for granting arms in England. England has three "Kings of Arms", or high heraldic officers (Lord Lyon is Scotland's only one): the Garter Principal, the Clarenceux (responsible for southern England), and the Norroy and Ulster (responsible for northern England and Northern Ireland). Unlike the English Kings of Arms, who cannot grant arms without a warrant from the (English) Earl Marshal, Lyon does not need permission, but grants by his own power. Whilst in England the Court of Chivalry (which last met in 1954) is a civil court, in Scotland the Lyon Court meets often and has criminal jurisdiction. Lord Lyon is empowered to have assumed coats of arms, and whatever they are affixed to, destroyed. As an example, when Leith Town Hall, now used as a police station, was renovated during the 1990s, several of the coats of arms decorating the Council Chamber were found to be attributed to the wrong person. The police were given special permission to retain the display, on condition that the tourist guides pointed out the historical anomalies. The Lord Lyon is also one of the few individuals in Scotland officially permitted to fly the "Lion Rampant", the Royal Banner of Scotland. A new collar of state was made in 1998- a chain with 40 gold links, replacing the item that went missing after the Battle of Culloden. In 2003 a new crown was made for the Lord Lyon, modelled on the Scottish royal crown among the Honours of Scotland. This crown has removable arches (like one of the late Queen Mother's crowns) which will be removed at coronations to avoid any hint of lèse majesté. Sir David Lindsay of the Mount was Lord Lyon from 1542–1554. A poet and diplomat during Renaissance Scotland. Sir James Balfour, 1st Baronet of Denmilne and Kinnaird was Lord Lyon from 1630–1654. Noted scholar, annalist and antiquary. In 1654 he was deprived of his office by Oliver Cromwell. The seal of the Lord Lyon King of Arms, created in 1673, depicting the arms of the Lord Lyon. Alexander Brodie, 19th of that Ilk was Lord Lyon from 1727–1754. Despite receiving the Lyon office as a political reward, he nevertheless undertook his duties seriously. Thomas Hay-Drummond, 11th Earl of Kinnoull was Lord Lyon from 1804–1866. Treated the office as a sinecure and left his duties to the Lyon Depute. Sir James Balfour Paul was Lord Lyon from 1890–1926. Lawyer and scholar, he wrote many books concerning Scotland's heritage. Sir Francis Grant was Lord Lyon from 1929–1945. Grant (left), and the Duke of York (centre) proceeding to St Giles' Cathedral in 1933. Sir Thomas Innes of Learney was Lord Lyon from 1945–1969, wearing the tabard of the Royal arms of the United Kingdom (with the Scottish royal arms taking precedence) and holding the staff of the Lyon's office. Dr. Joseph John Morrow has been Lord Lyon since 2014, wearing his wig and judicial robes as Lord Lyon. King James IV. Thomson was described by his king as "an experienced councillor" and "a man of much diplomatic skill" had been requested by King John as a mediator (the two kings were cousins), and to inform him that Scotland was unable to send ships to aid him in the Dano-Swedish War. Formerly Islay Herald. 6 June 1724 Also Rothesay. 2 November 1770 After the death of John Hooke Campbell in 1795, Boswell was Lyon ad interim until the appointment of Lord Kinnoull in 1796. 9 November 1863 Appointed Lord Lyon King of Arms in 1866 and served in that post until his death in 1890. Argent a lion sejant guardant Gules armed and Iangued Azure holding in his dexter paw a thistle Proper and in his sinister a shield of the second; on a chief Azure a St. Andrew's cross of the first. On a compartment below the Shield are set the proper Supporters of the Lord Lyon King of Arms. two lions rampant guardant Gules armed and langued Azure each crowned with the proper crown of the Lord Lyon King of Arms, their bodies semee of thistles crowned Or. Argent a lion sejant guardant Gules armed and Iangued Azure holding in his dexter paw a thistle Proper and in his sinister a shield of the second; on a chief Azure a St. Andrew's cross of the first. Around the Shield is placed the Lord Lyon’s Collar of Thistles linked with sprigs of rue interwoven Or and having from it pendent by a Scottish Imperial Crown Proper an oval medallion Or displaying the figure of Saint Andrew vested Vert surcoat Purpure bearing before him the cross of his martyrdom Argent. ^ Moncrieffe, Ian; Pottinger, Don. Simple Heraldry Cheerfully Illustrated. Thomas Nelson and Sons. p. 48. ^ Moncrieffe, Ian; Pottinger, Don. Simple Heraldry Cheerfully Illustrated. Thomas Nelson and Sons. p. 63. ^ Holme, Chris; Duncan, Raymond (19 October 1998). "A Yankee sorts the Court of Lord Lyon". The Herald. Glasgow. Retrieved 25 February 2018. ^ "Lord Lyon gets his crown back". The Scotsman. 13 July 2003. Retrieved 25 February 2018. ^ a b Stevenson, J. H. (John Horne); Seton, George (1914). Heraldry in Scotland : including a recension of 'The law and practice of heraldry in Scotland' by the late George Seton. Glasgow, J. Maclehose. pp. 445–446. ^ Campbell-Kease, John (2018-03-01). The Heraldry Society. Coat of Arms no 179. ^ a b Fox-Davies, Arthur Charles (1909). A complete guide to heraldry. London ; Edinburgh : T.C. & E.C. Jack. p. 40. ^ Rogers, Charles; Grampian Club (1871–72). Monuments and monumental inscriptions in Scotland. London: London : Pub. for the Grampian Club [by] C. Griffin. p. 414. ^ Burke, John (1835). "A genealogical and heraldic history of the commoners of Great Britain and Ireland, enjoying territorial possessions or high official rank; but univested with heritable honours". Notes and Queries. s4-VI (148): 377–378. doi:10.1093/nq/s4-vi.148.377-g.
^ a b c Grant, Sir Francis James (1945). Court of the Lord Lyon: List of His Majesty's Officers of Arms and Other Officials with Genealogical Notes, 1318-1945. Society. ^ a b c d e f g h i j k Paul, James Balfour (1900). Heraldry in relation to Scottish history and art; being the Rhind lectures on archaeology for 1898. Edinburgh, D. Douglas. pp. 81–88. ^ Morgan, Hiram (2008). "Scotland in Renaissance Diplomacy 1473-1603, Scotland to Denmark" (PDF). University College Cork. Bloomsbury Academic. Retrieved 2018-11-05. ^ Hutchinson, Robert (2011-04-07). Young Henry: The Rise of Henry VIII. Orion. ISBN 9780297859536. ^ Thomas, Andrea (2008-06-25). Sixteenth-Century Scotland: Essays in Honour of Michael Lynch. BRILL. p. 52. ISBN 9789047433736. ^ Thomas, Andrea (1997). "Renaissance Culture at the Court of James V, 1528-1542" (PDF). www.era.lib.ed.ac.uk. Retrieved 2018-11-06. ^ a b c Stevenson, Katie (2013-10-24). 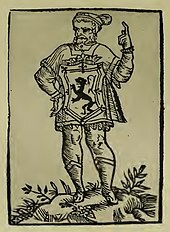 Les 'autres' rois: Études sur la royauté comme notion hiérarchique dans la société au bas Moyen Âge et au début de l'époque moderne: The Scottish King of Arms: Lyon's place in the hierarchy of the late-medieval Scottish elite (in French). 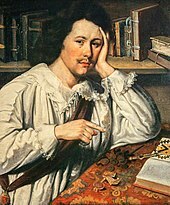 Walter de Gruyter. pp. 64–79. ISBN 9783486989304. ^ Mackay, Aeneas James George. "Lindsay David (1490-1555)". /en.wikisource.org. Retrieved 2018-11-06. ^ Learney, Sir Thomas Innes of (1971). Scots Heraldry: A Practical Handbook on the Historical Principles and Modern Application of the Art and Science. Genealogical Publishing Com. p. 74. ISBN 9780806304786. ^ Simpson, J. M. (1970). R. Sedgwick (ed.). "BRODIE, James (1695-1720), of Brodie, Elgin". The History of Parliament: the House of Commons 1715-1754. Boydell and Brewer. Retrieved 30 April 2015. ^ a b Emslie-Smith, Dr Donald (2005). "An Eighteenth Century Scots Heraldic Negotiation" (PDF). www.rcpe.ac.uk. Retrieved 2018-11-07. ^ a b James Balfour Paul (1908). The Scots Peerage. D. Douglas. p. 232. ^ Stephen, Leslie; Lee, Sidney, eds. (1890). "Harley, Thomas" . Dictionary of National Biography. 24. London: Smith, Elder & Co.
^ Kearsley's Complete..., 2: Together with an Extinct Peerage of the Three Kingdoms List of All Their Family Names, Titles of Elder Sons & and Translation of Their Mottos. G. Kearsley. 1804. p. 355. Retrieved 9 August 2013. ^ Burnett, George (1901). The family of Burnett of Leys, with collateral branches : from the mss. of the late George Burnett. Aberdeen Printed for the University. ^ "Scottish Post Office Directories > Towns > Edinburgh > 1805-1834 - Post Office annual directory > 1832-1833". National Library of Scotland. Retrieved 29 September 2016. ^ "Sir James Balfour Paul, Scottish Herald and Antiquary". The Times. The Times Digital Archive. 16 September 1931. p. 17. ^ "New Lyon King of Arms". The Times. 14 September 1926. p. 17. Retrieved 2009-07-17. ^ "No. 33489". The London Gazette. 26 April 1929. p. 2762. ^ "No. 37137". The London Gazette. 19 June 1945. p. 3196. ^ "Bio: Sir James Monteith Grant KCVO, FRHSC (Hon)". www.heraldry.ca. Retrieved 2018-11-09. ^ Tomlinson, Richard (20 December 1992). "They also serve, who only ush". Independent. ^ "Hunt for new Lyon King as Sir Malcolm lays down his Arms". The Herald. 2 September 2000. Retrieved 3 March 2018. ^ "No. 24961". The Edinburgh Gazette. 13 February 2001. p. 304. ^ "No. 25116". The Edinburgh Gazette. 9 November 2001. p. 2663. ^ "New Lord Lyon King of Arms appointed". Scottish Government News. Retrieved 2018-11-05. ^ "Advocate appointed new Lord Lyon King". HeraldScotland. Retrieved 2018-11-05. Wikimedia Commons has media related to Lord Lyon King of Arms. Wikimedia Commons has media related to Coats of arms of the Lord Lyon King of Arms.